We all know the familiar bottle with the Red Dot saying “One Drop Does It”® on the Original Louisiana Brand Hot Sauce – your basic cayenne pepper, vinegar and salt hot sauce. 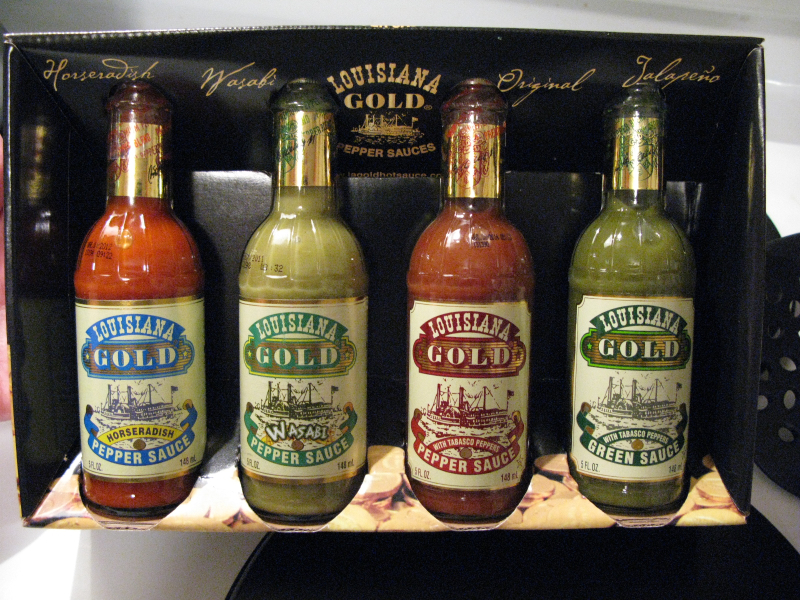 They’ve recently launched a line of premium sauces called “Louisiana Gold“. And the big news is they’ve blended their peppers with Tabasco peppers and “spirit vinegar” to create a bold new taste. The term ‘spirit vinegar’ is sometimes reserved for the stronger variety (5% to 20% acetic acid) made from sugar cane or from chemically produced acetic acid – source: Wikipedia There is a sweetness in the Red Pepper Sauce that I feel makes it much better than the original. This set consists of the Red Pepper Sauce, and a Green Pepper sauce both blended with Tabasco peppers, as well as their new Wasabi Pepper Sauce and their Horseradish Pepper Sauce. More on those flavors in another post. But this 4 pack comes in a beautiful, award-winning box. I went straight for the Red Pepper Sauce first. I’ve never been a big fan of Louisiana style sauces. To me they all taste about the same – salty with mild heat. But this new Gold Pepper Sauce is so much richer tasting that I’ve become a fan of it after the first taste. It’s still a bit salty, and the heat level is slightly higher (than Original) with the addition of the Tabasco peppers, but there’s a hint of sweetness to it. Probably from the spirit vinegar. 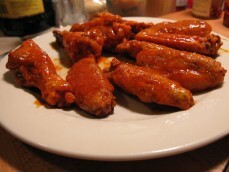 We made some hot wings using the Louisiana Gold Red Pepper Sauce with a little butter, and they turned out very tasty! While I can’t honestly say this would be my go-to-everyday hot sauce… I will use it whenever I want an authentic Louisiana-style sauce. I can’t wait to crack open the other 3 bottles and tell you all about them as well. I can’t wait to hear about the wasabi and the horseradish versions. .-= A post from Chris’s blog …Sriracha Wings & Saffron Rice =-. As always, good review. I’m getting the 4-pack of these soon. Can’t wait to try ’em. The labels definitely bring out the old style look, and I really like that. I too can’t wait to hear about the wasabi version. The only time I ever tried this product was at a cajun restaurant on Long Island. Good with that type of food, especially their sweet potato fries. 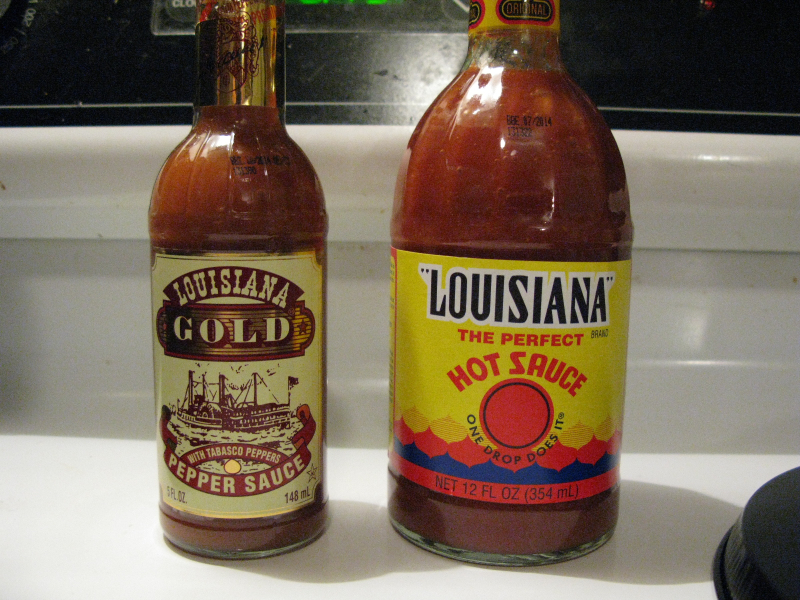 Just came across this review (six months late), but have to note that Louisiana Gold Red Pepper Sauce may be new in your area but I have been buying it in the midwest for 15 or 20 years. I think it’s pretty good, but my “go to” sauce is still Frank’s Original. Great site. I am from Louisiana and eat hot sauce on every dish. I go through 1 bottle of Tobasco every 10 days. I now live in Gabon, Africa and Tobasco is $7/bottle. 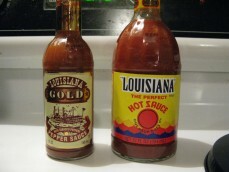 Today, I found a small shop that sells louisiana gold for $3/bottle. I am not a big fan of the original Louisiana hot sauce but can’t wait to try Gold! Hey Ryan, be sure and come back here and tell us how you liked the Gold! Those all sound great. I also am excited to hear about the horseradish one! They have a nice logo as well. Absolutely love the Louisiana Gold sauce. I’ve been getting the 2 oz. bottles from Dollar Tree for $1 for the past year so am now addicted. Of course they quit carrying it after getting me hooked! I’m shopping around but have found nothing close in price. May have to bite the bullet and spring for full price.